The “Flipped Classroom” is an exciting and engaging model of instruction that puts the learning in the hands of the student and asks the educator to facilitate the learning process. Andrea Prupas, the head of inov8 Educational Consulting, whose firm specifically addresses special education and technology also points out that instead of using these new tools to “do things differently,” special education teachers need to use the same technology applied in general education classrooms to “do different things.” According to Prupas, a “truly flipped approach” starts by looking at students’ specific needs. Instructional Design Methods can help Educators systematically design flipped courses that keep learning objectives at the core of instruction, have modifications for individualized learning and incorporate project based learning & technology. The discussion below will center around a Social Studies class being flipped using technology including Moodle and Captivate e-Learning Software. This is a recent lesson that was flipp"ID" for a co-taught American Cultures II Class. The lesson focuses on FDR's New Deal and has the students create their own Fireside Chats. This module can also be modified to meet individual students' needs. Below is highlights from a module that was adpated so that a student with multiple disabilities could complete it on an iPad and answer the questions in a "touch" fashion. 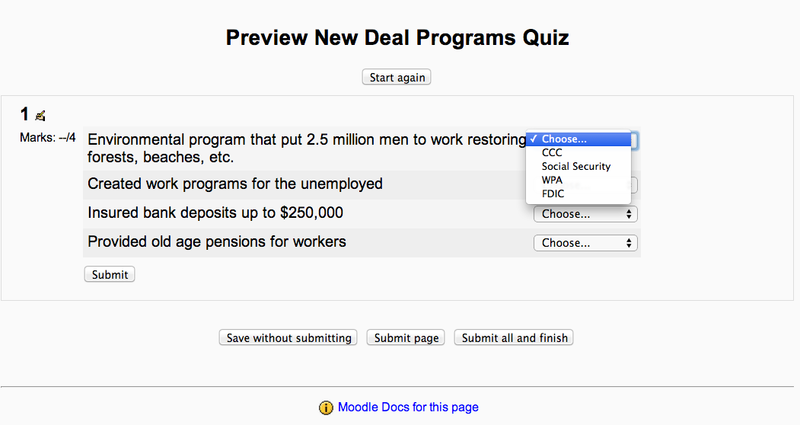 Next, students completed a knowledge check in class via a Moodle quiz and listened to some of FDR's original Fireside Chats. They paired up, investigated a New Deal program that was assigned to them and created a fireside chat using Quicktime player. After all of the students had submitted their Fireside Chats, they competed in an audio space race where they had to listen to other student's fireside chats and identify the program being discussed.